Sunday, Apr 7th 2019 1-3pm “Swingin’ into Spring at The YM-YWHA"
"Jazz & Poetry and More…." "A Musical Tribute to Great Ladies in Jazz"
Open Seating, Full bar including wine, beer, cocktails, soda, coffee, etc. This is a BYOB EVENT!! at the Wilkins Theater on the campus of Kean University, 1000 Morris Avenue, Union, NJ. prominent tap dance company promoting and preserving the art form of rhythm tap dancing. Evan Ruggiero, Kyle Wilder, Nicholas DiNicolangelo, DeWitt Fleming, Jr., Parris Mann, and Hillary Marie-Michael and Katrina Richter just to name a few. The company will also pay tribute to their music director of 22 years, Broadway Conductor the late J. Leonard Oxley. high energy performance for audiences of all ages. It’s a celebration 25 years in the making and one you don’t want to miss! Ticket prices are $75 Preferred Seating/ $35 Standard Seating/$25 Students and Seniors and Group Rates for 10 or more are available. Big Band Jazz Concert Featuring "Full Count Big Band"
Midday Jazz Midtown is a series of hour-long concerts most Wednesdays at 1:00 p.m.
a $10 food/beverage minimum for all NJJS sponsored events. Drinks and food will be available throughout the afternoon. Reservations are suggested: www.shanghaijazz.com or 973-822-2899.
on the Arts/Department of State, a partner agency of the National Endowment for the Arts. "Sweet Sounds of Downtown Westfield"
"Old Fashioned Jam Session - Open Mic"
Carrie Jackson & More…IT’S LADIES NIGHT!! "Contemporary Art Group Gala Celebration"
Contemporary Art Group will represent thirty-two artists exhibiting painting, pastels, fine art photography sculpture and ceramics. The Deer Head Inn, home of jazz in the Pocono Mountains for more than 60 years. "Straight Ahead Jazz & Blues Music"
"RELATING TO OUR PAST, UNDERSTANDING AND PREPARING FOR OUR FUTURE"
Friday, Aug 26th 2016 7-11pm Carrie Jackson's "Birthday Jam"
"Sweet Sounds of Downtown Westfield Music Festival"
Thursday, Aug 11th 2016 7:30-9pm Summer Stage "Metuchen Rocks Concert"
Tickets are $15 in advance or $18 at the door call 973-971-3706 for more details. Justin Kauflin - Seeing Eye Graduate, “Jazz Artist of the Year – Veer Magazine"
Carrie Jackson “Come to the Cabaret! 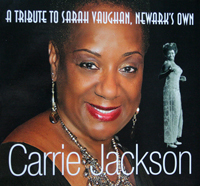 Sarah Vaughan "Commemorative Forever ® Stamp"
"A Tribute to Sarah Vaughan, Newark's Own"
"A Tribute to Jazz Legends"
** We recommend using 4265 Atlantic Avenue, Farmingdale for GPS directions. The Edgewater Arts Council and Yogart Frozen Yogurt Studio are partnering for The Yogart "JAZZ IN JUNE" music series.